B&B is a joy to work with! Their design team is fantastic, and they deliver exactly what they promise. Their attention to detail is amazing and their customer service is incredible! We couldn’t be happier with our pool! Thank you B&B for making our dream pool become a reality! 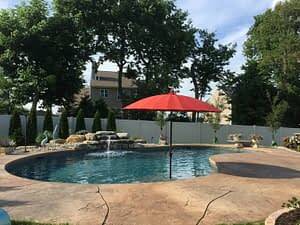 I am located in Hellertown PA. B&B Pools completed my pool in spring of 2017. I am very happy with pool, design, and overall experience. Growing up in the area I knew several B&B owners who had great long term experiences with B&B so reputation put them on the top of my list of contractors that I investigated when picking a pool builder. I am very happy with the decision to use B&B. The president, Ed Mehlig, took a lot of time to understand my families needs and wish list for the project and did a great job incorporating them into the final design while staying within a budget. I do a lot of projects around the house myself and Ed also was a great asset when it came to guidance and advice for tying in an adjacent deck/patio to the pool area as well as the overall landscape design. One bit of advice I would recommend to anyone looking at contractors for an in ground pool is to understand the longevity of the pools the pool companies have installed over the years. 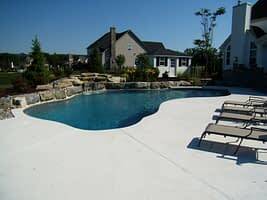 B&B has an excellent track record for their pools holding up long term which I can’t say the same about several other companies in the area that I investigated. Price and customer service are important to me but the most important factor was having a product that would hold up long term and have strong support when an issue does pop up. From my investigation in talking with long term B&B pool owners and landscape/construction contractors that have worked around all the different pool companies products………..They all recommend B&B for a solid product that will last for years! 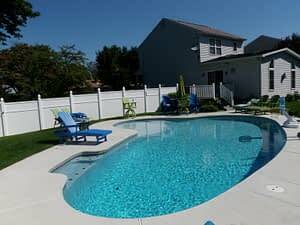 B&B also has a store in Hellertown that is staffed with knowledgeable people to support your pool for equipment, chemicals, and accessories that I find very convenient that not all pool companies have. Overall, Very Happy with B&B and highly recommend them! We love our new pool! B&B built us a wonderful pool that looks beautiful. I feel that the workmanship is very good and that it will stand up over time. Ed walked us through the entire process and explained our options very well. The design was everything we asked for and worked beautifully with our property size. The cost was certainly not the cheapest, but the product was high quality. Ed Mehlig and the whole organization are true professionals. From the day he sat down with us to discuss what we were looking for in a pool, to the design process, getting the permits and the whole construction process Ed who is the president was always involved and always available via his cell phone. Moe the construction project director was very knowledgeable and you could tell he took great pride in his work. Marcia in the office was always on top of everything and available for questions and helping any questions we had. Tony who is the vice president then came in when the pool was built and ensured it was brushed daily and the chemicals were just right for the first few weeks before they handed everything over to us. They were meticulous with everything and amazing to work with. True professionals with an honest work ethic are very hard to find these days but their whole organization proved there are still companies out there who care about their customers and the quality of their work. They actually finished our project one week ahead of schedule despite weather delays which is unheard of and pretty amazing. I wish everybody would take as much pride as they do in their work. They were so good and economical with construction that we are now hiring them to maintain our pool also. I wouldn’t hesitate in recommending them to anyone I know. Quality, organized and professional customer service from the office staff to the pool building crew. B&B provided clear guidance through the entire pool process – from permit to opening indoctrination day. Anytime I was a bit nervous, they all were patient with me knowing that although this was my first time building a pool, they were the seasoned professionals who understood that this was my dream pool – a one time deal of a lifetime. I have already recommended B&B to my neighbors who expressed interest in building a pool. I was honored when Barry (the owner of B&B) stopped over to check on things and make sure I was happy even though I wasn’t a “million dollar pool” project. I was treated just as important. Thank you so very much. No doubts – B&B all the way! BBCP installed our pool 9 years ago and we continue to be happy with the pool and the service. They worked closely with our landscaping company so together they could provide us with our “back yard oasis”…and they accomplished just that! We also use BBCP to open and close our pool and for any needed service. We buy all of our chemicals from them and have found, since they supply quality products, the pool remains balanced for longer periods of time and every year needs less and less adjustments. The service crews are always friendly and willing to answer questions and the store and office staff amazing! Don’t hesitate….Call BBCP! From the design phase of our custom pool through the construction and the absolutely perfect finished product a pool of our dreams!!! B&B pools will take care of you every step of the way!!! Cannot praise the entire staff enough!!!! I cannot say enough wonderful things about BBCP. From the first call I made to inquire about a pool, all the way through the day we jumped in—this company was an absolute dream to work with. Every single worker that I spoke with or was sent to my house was professional, courteous, and absolutely meticulous in their work. I can honestly say that each worker treated my pool as if it was to be their own. I worked with them to turn my little pool-shaped scribble on a post-it into my dream pool. They helped me build a budget that incorporated the most important things to me, and I look at my pool today and feel it’s *perfect. * Their opinions are those of an experienced and *caring* company. They get back to you quickly, and you truly feel like their highest priority at all times. I never had to worry or call about their timeline—they were completely on top of the job at all times. BBCP is a *superior* pool company on every front, and I would whole-heartedly and enthusiastically recommend them to ANYONE with full confidence in their product. Choosing BBCP to build my pool is the best decision I’ve made as a homeowner! The folks at B&B have been exceedingly helpful in learning how to efficiently operate and maintain our pool. They closed the pool last fall, and in April 2014 I asked them to help open it after a very hard winter. They did a great job cleaning and folding the cover, and gave me great tips on how to protect it from critters while in storage. The pool was sparkling under the cover and the crew put the initial chemicals in. They took the time to discuss some issues, and helped me understand the process required to fix them. A few parts were needed and they had them on the truck, which saved time. They tested everything and it’s ready for the weather to get warm! Their chemistry and parts pros at the nearby store are also extremely helpful. I’m very glad to have their help. This was our first pool so I totally trusted the advice and recommendations that B&B employees provided us in conjunction with our input, and the end result was “just what we wanted”. For example, I wanted a shelf and they recommended putting tiles all around the shelf. They were always professional and dependable. Nothing was an effort or too much trouble for our project manager. Emails were timely and informative. There were no hidden expense. Once work as completed, we then received the bill. Top quality work from all subcontractors as well. 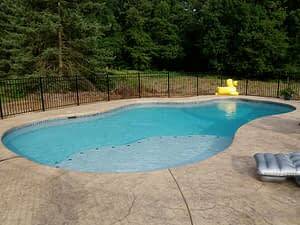 We are totally satisfied and would highly recommend B&B Pools.